The following security objects need to be applied for the end user to utilise Resource Bookings. Depending on the approach to security your school uses, these securities can be added to an existing Security Group or a set of smaller, more descriptive groups can be made, then assigned to the Back Office user (Eg Resource Booking, Resource Management…). 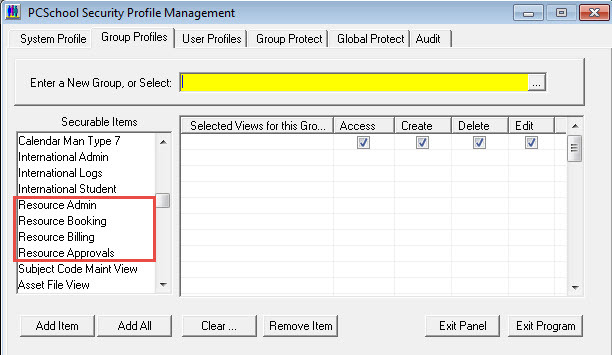 The “Resource Admin” security object is sensitive to the “Edit” and “Delete” options. A resource “Supervisor” is always able to edit and delete a booking, as is the user who created it. Resource Admin This is required to see and use the ‘Setup Resources’ control in Spider. This will allow the user to select rooms and assets, create and edit categories, as well as remove resources. Resource Booking This is required to see and use the ‘Resource Booking’ control in Spider. This will generally be given to staff to allow them to book rooms or resources. Resource Billing This is required to use the Billing ability in the resource booking control. Resource Approvals By default, the supervisor of a resource category can approve a booking. If you wish other people to approve resources, this security can be given. It will allow the user to approve bookings across all categories.